Typically, when a firmware developer (or any software developer for that matter) has things his or her way they write all code from scratch. It’s the ideal way to go since it allows a good process, good tests, static analysis and coding standards to be put in place from the start. This is by far the cheapest way to build quality code. But the reality is that rebuilding everything from the ground up isn’t always feasible. There are times when legacy code1 has to be changed and maintained. Depending on the company and the engineer’s role, this may even be the majority of the firmware developer’s work. Is there a way to do it well or is it destined to just patch on top of patches in an endless bowl of spaghetti? You have already developed a very good and methodical approach to maintaining legacy code and you are like the man in the middle panel. You probably don’t need this article but might learn something anyway. You do not have a good understanding of software brittleness and the potential for even the smallest code changes to introduce big problems. You need this article. Read on! Earlier in my career, I worked in the defense sector doing legacy sustaining work on embedded systems. As I started to dig through reams of embedded C, I quickly learned that I was dealing with code that had never been rigorously tested and had little to no unit testing done against it. I also learned that certain sections of code had always ‘just worked’ and if I was going to make changes in those sections, I had better not break anything. It wasn’t long before I was gripped with the paralysis of needing to make changes but being terrified to do so. If you are like me when I started, you feel like the man in the third panel. You understand that even small changes to the code can introduce huge issues and so you have a vague sense of terror but you don’t really know where to begin when it comes to adopting a safe approach to maintaining legacy code. I’m so glad you’re here. In this post, I’m going to try to summarize a good and safe approach for you. Please read on! How do you master the art of legacy code maintenance? Test Driven Development. So what is TDD (Test Driven Development)2? Fundamentally, it preaches that all software work starts with developing a test and then finishes with making the actual code change. In other words, the code changes are driven by the tests. If you’ve been in the field of software development for more than three days, you’ve probably heard of TDD before. When it comes to legacy code, you might be thinking “look I know that test-driven development is great for new code development, but when it comes to legacy code it just doesn’t apply”. I want to humbly insist that you couldn’t be more wrong. Test-driven development is the key to efficient, high quality and safe code maintenance. This is particularly true for code that has never had any tests run against it before. In the following sections, I’ll break down why this is true and my hope is that by the end you’ll agree. I want to focus in on that last part, that bit about holding “an object firmly while work is being done on it”. That is our key when it comes to stepping into unknown software or firmware. We want to hold it in place, to prevent it from moving, to prevent the functionality of the code that is being worked on from changing. When I was a kid, my dad had a vise on his tool bench. I used to love going into the garage, clamping a old piece of wood into the vise and driving nails into it until it looked like a porcupine. I always put the wood into the vise first because I knew that no matter how hard I hit it, it would stay firmly in place. It wouldn’t fly off and put a hole in the wall or break a window. In software sustainment, the developer is typically entering a section of code that needs some new feature or needs a bug fixed. In the case of a bug fix, the goal is to fix the problem without changing the functionality of the code. If a feature is being added, 99.9% of the functionality must remain identical. The only functionality that is changing is the new feature. In either case, a vise must be placed around the code such that the developer can safely and confidently make the changes and rest assured that only the intended functionality is changing and that bugs are not being introduced. changed to add the new feature or fix the bug. 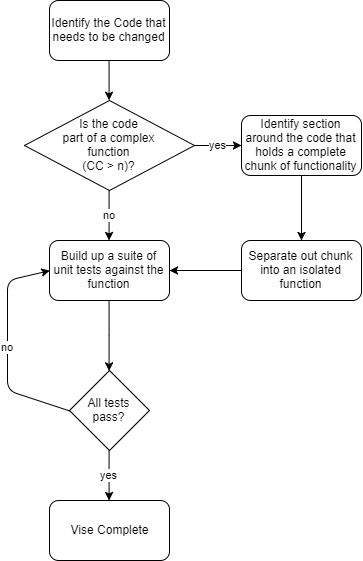 Analyze the Complexity – If the code is not part of a complex function (see cyclomatic complexity), the function is already isolated and ready for test. Skip to step 5. Encapsulate Functionality – If the code is part of a complex function and writing unit tests against the entire function is not possible, just start with the code that needs to be changed and back out until you have captured a complete subset of functionality. This may involve the 10 to 20 lines surrounding the code that will be changed. Isolate – Once the above suite of complete functionality has been identified, isolate it into its own function. Be careful not to change the code other than the absolute bare minimum needed to isolate it into a separate function. Test – Build up a set of unit tests against the isolated function, using code coverage tools if necessary to ensure full coverage. Once all tests pass, the vise is in place. Once these steps have been followed, a good software vise is in place and the code can be safely modified. Let’s dive an simple example. The iconic first person shooting game DOOM, which was first released in 1993, has the huge advantage that the source code was released by creator John Carmack in 1997. What more appropriate way to show the power of TDD in legacy code maintenance than on the DOOM source code? Follow me on a hypothetical journey of chainsaws, gore and… code maintenance? After some digging, Jane identifies that this change should be made in the G_BuildTiccmd() routine in the g_game.c module. Studying this code more, it is apparent that the gameplay works like this: when the user holds down the right/left key or holds the joystick in the right or left position, the player begins to turn that way at the ‘slow’ speed and as the key or joystick continues to be held past the SLOWTURNTICS timeout, then the turn speed increases to whatever is currently contained in the speed variable. The purpose of this explanation is not to give a tutorial on how turning works in the game, but rather to understand so that we can identify where the code will need to be changed to add the new feature. This line is not highlighted.